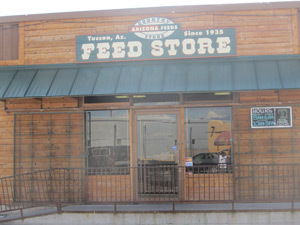 In the spirit of Arizona Feeds Country Stores tradition, we still carry everything you need for your horse but have also incorporated a full line of animal and pet products. And if we don’t have what you’re looking for, just ask, we may be able to special order it for you. Along with a large variety of product choices, our knowledgeable staff is here to answer all your pet questions. Our larger North store location is on the southeast corner of I-10 & Ruthrauff. You’ll find a large selection of feed and products for your animals – large or small. Our other store is in the heart of South Tucson just 2 minutes off the I-10 on 6th Avenue. Recently remodeled and looking great, this store is known as your one stop poultry shop, but have been expanding equine products and other product lines to now be your one stop animal shop. Come check us out, we think you will be pleasantly surprised!